The strength of a pressure man defense stems from its helpside defenders. In Vol. 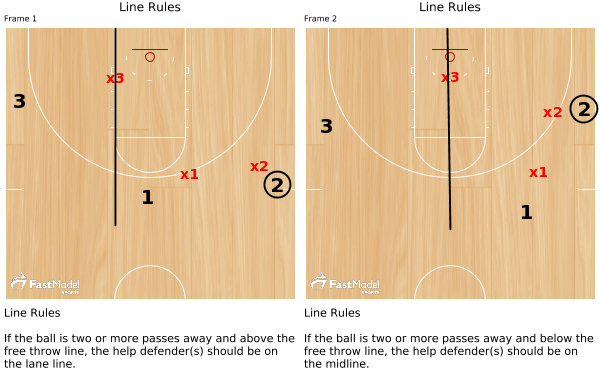 3 of this series, we take a look at a few concepts to build help defense. Pressure man defense is only as good as it’s help defenders. For on-the-ball defenders to aggressively force ball handlers down the rooftop, they must trust that help defenders can aide them if they are beaten off the dribble. Off the ball defenders can afford to play passing lanes when help defenders are in perfect position. If the ball is two or more passes away and above the free throw line, the help defender(s) should be on the lane line. 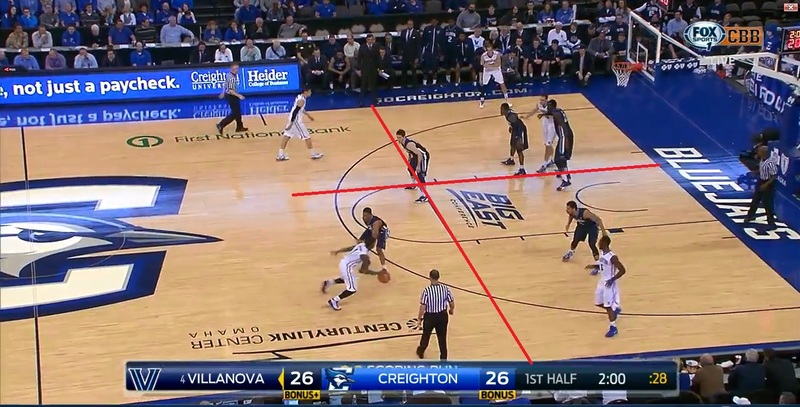 If the ball is two or more passes away and below the free throw line, the help defender(s) should be on the midline. These are rules. They are clear and easy to follow, critique and drill. On film it is easy to see if players are following the line rules. The rules give help defenders a clear rule to follow. 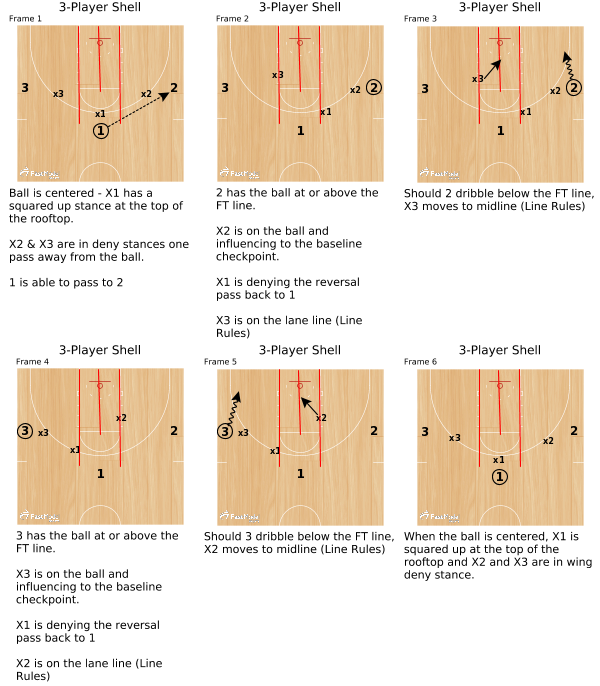 One mantra of pressure man defense is to prohibit straight line passes. The defense must pass over or under you but never “through” the defense. For this reason, the helpside stance in pressure man defense should differ from the traditional man-to-man helpside stance. Many coaches teach an open stance when on helpside. The help defender is facing the opposite rim and has his/her “pistols” up pointing to the ball and their man. In pressure man defense, eliminate the “pistols” stance and just replace it with deny stance. Follow the line rules and get on the prescribed line, but use a deny stance. Players should have their backside towards the basketball. They can still see ball and man, but he closed stance discourages straight line passes through the defense. A deny stance while on helpside encourages the offense to throw over the defense. To teach the line rules and proper helpside stance use three and four player shell drills. In the three-player shell drill there is a single help defender to evaluate for stance and positioning. As passes are made among the three offensive players, the defensive players move into proper stance and position. In a four-player shell drill there are two helpside defenders to evaluate for stance and positioning. Shell drills are excellent for drilling the fundamental concepts such as line rules and stance. Emphasize jumping to the ball and moving as the ball moves. The help defenders are vital in shell drills. In coming posts, we will discuss help rotations, defending ball screens and screening action away from the ball in a pressure man defense.